Just listening to the Radio Live news reporting that John Key is focussing on young people at the National Conference today. There was a snippet of him speaking about how their lives could be damaged by the recessional environment of few jobs. "As part of achieving that consensus, an agreed priority must be established. For Maori that priority must be to stop the inflow of young people into the benefit system. Many, including exisiting beneficiaries, can be persuaded of the sense and humanity in this. That aim is even more important than dealing with present caseloads." NewstalkZB is also reporting; He is expected to launch a new youth opportunities package tomorrow. Key will have to make sure that those opportunities are more attractive than going on a benefit - especially for young females. Or restrict the access of young people to welfare. Teens as young as 13 are more likely to stay in school and proceed to the next grade when access to welfare is restricted, says a University of B.C. researcher. Bill Warburton had observed that the dropout rate for children at risk of receiving income assistance rose with B.C. 's welfare caseload through the early 1990s and fell when a substantial package of welfare reforms was introduced Jan. 1, 1996, which removed about 100,000 people from the welfare rolls. "We wondered if that was a coincidence," wrote Warburton, executive director of the Child and Youth Development Trajectories Research Unit at UBC. Using data from the B.C. ministries of education and employment and income assistance, Warburton found that when the New Democrats began a program of welfare reform in the mid-1990s, high school dropout rates began to fall and continued to fall for several years. Dropout rates had been rising through the early 1990s as access to welfare expanded and was liberally extended to minors, but the change in policy quickly reversed that trend, he explained in an interview and a written response to a query from The Vancouver Sun. The effect was stronger the older the student and the closer the student was to being eligible for welfare, he said. But it was also significant in students as young as 13. "I was surprised at how young the kids were that responded [to the change]," said Warburton. "We found strong evidence that it wasn't a coincidence." Warburton worked for the B.C. income security renewal secretariat in the mid-1990s and for the research branch of the Ministry of Employment and Income Assistance through 2004. He was aware that some regions of the province were "more on board" with welfare reform during the late 1990s. By comparing data between regions, he was able to determine that the effect was strongest -- that is, kids tended to do better in school -- in areas that put the tightest controls on income assistance for people under 25. The teens' expectations about the availability of welfare is at the heart of the effect, according to Warburton. "I would have guessed that their decisions would be influenced more subliminally than consciously," he said. But the data showed that teens who left school and went on to collect welfare tended to come from the same schools, suggesting that localized welfare cultures had developed. The kids talk to each other about how to apply, they see their older friends getting welfare. The data suggests that kids are communicating with each other about the system and how it works, he said. No wonder they need so many parliamentary holiday breaks! I haven't been overseas for 8 years, and that was a trip across the ditch. Don't even have a current passport and neither do my children. I wear-out clothes and shoes. Last week I changed my car because it was 14 years-old, had done over 200,000 km and failed its warrant ...seriously. We traded it for a 7 year-old car (which I am in love with). Yesterday I got a tax refund of $143 which is a third of the donations I made to charity last year. I was really chuffed. That's a tidy sum of money to me. When I use my car for volunteer work I don't claim mileage. My home is large by necessity (we both work from home and painting takes up a lot of space) and comfortable but we haven't turned on the underfloor heating in years because its too expensive. We have takeaways on Friday but eating out is a treat. My husband has inherited land but I have always made it clear to him that is his - not mine. Both of our children go to state schools. One has singing lessons and the other has piano lessons. Like me, they also wear-out their clothes and shoes. What I am trying to convey here is a modest lifestyle (bar consumption of wine). So reading about MPs perks, which for some reason I hitherto had not given much thought to, leaves me feeling rather underwhelmed. I am not sure which is more deflating. Discovering a perfectly able beneficiary is getting $715 a week or that we are paying for 90 percent of MPs overseas holidays. Look, consumerism and consumption make the world go around but to the politicians, for pity's sake, use the money you earn. You are hardly underpaid. Roger Douglas spent his political career opposing privilege - that is the practice of the state forcing one individual or sector to pay for or subsidise the activities of another individual or a sector. In that I fully support him. The other ex MPs he is now testily pointing to as enjoying the same right and entitlement as him to travel the world on the taxpayer, did not make a holy grail out of attacking privilege. That is why it just doesn't wash as an excuse, recession or not. 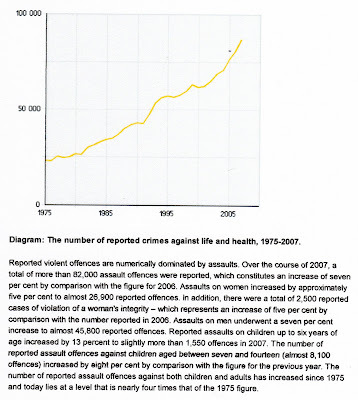 These graphs are from a sustainability report released yesterday by Statistics NZ. The first shows that currently, for every 100 people aged 15-64 there are around 50 younger or older. That allows a rough measurement of dependency notwithstanding that people older than 15 are often still dependent and people over 65 are not. 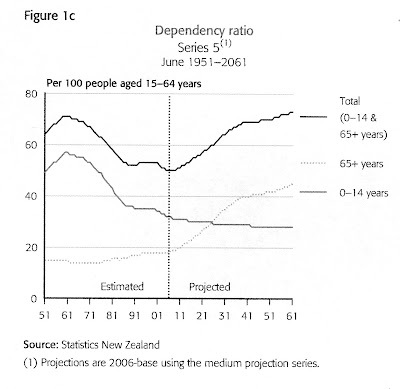 By 2061, when my children will be in their 60s, there will be around 73-74 dependants for every 100 15-64 year-olds. If nothing changes about the extent of government involvement in health, education and welfare that's a truckload more tax to be paid. This one simply depicts the increasing diversity of the population. Note that it only projects out to 2026 - not 2061. 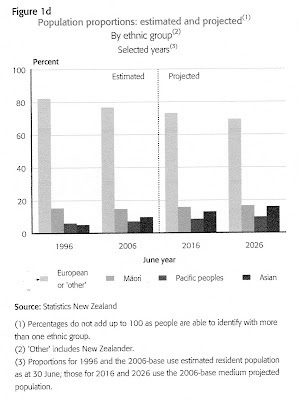 Not that we didn't know it, but the graph highlights that the Asian population is growing faster than the Maori population. Not something I have a problem with but it is going to bring political tensions and friction. Finally it has to be said these are projections - they are not written in stone. Thousands of young women are using the welfare system to embark on motherhood with no partner or financial support. The claim comes from welfare commentator Lindsay Mitchell who says that figures show that during 2008 2,300 females aged 18-24 years-old transferred from a pregnancy-related sickness benefit to the domestic purposes benefit. "These are young women who had no partner or financial support before or after birth." "In one year alone the cost of supporting these women would be around $50 million. But that is just a start. Typically those who begin on welfare young, stay dependent for many years, often having more children. Because being long-term dependent on welfare has been shown to produce poor educational and health outcomes for both mothers and their children, the downstream costs to society are ongoing. And females born to young single mothers are far more likely to become single mothers themselves repeating the cycle." At a time when the government is cutting back on funding for severely disabled children and training allowances it is enormously surprising and disappointing that they are determined to ignore this huge problem. Last week, when the NZ Business Roundtable released a paper suggesting the DPB be replaced with time-limited assistance, the Prime Minister described the proposal as 'draconian'. Yet President Clinton and his democratic government did exactly that in the United States during the 1990s. "The National Party needs to start paying some real attention to how welfare is being used. The public response to this week's revelations of surprisingly high DPB payments and entitlement attitudes should be taken as a strong indication that many want to see significant change." Tables released under the Official Information Act attached. Also for peoples information those benefits have multiple layers to it.. your core benefit is only about 460, IRD give ALL parents between one to two hundred per week depending on numbers of children and the rest is accomodation that ALL low income earners are entitled too. My benefit is 620 (including ird) with two kids and my rent in Auckland is a cheap (??) 360 per week.. i cant have flatmates, i dont have a partners pay packet and i tell you its fricken hard work.. try feeding two growing kids and the rest in whats left. Im at uni and claim another 80 for transport and pay all my own fees and books.. its all for you to see and if you'd like to walk a few days in my shoes your more than welcome. That's another receiving $700 a week and resenting it. Someone put a pertinent question to me this morning. How are people like this ever going to get off a benefit because, even armed with a degree, no entry level job in the private sector is going to pay that much? Is that what the public service is for? So much for a welfare safety net. This isn't somebody experiencing a crisis. It's somebody who has gotten the pieces of her life in the wrong order ie got kids before qualifications, and gracelessly expects the taxpayer to sort it for her. I wonder how those workers who are being made redundant only to find they have no unemployment entitlement would view this outburst? "This form of silencing opposition is simply not acceptable in a democratic society and I hope the Government will urgently reconsider its intimidating tactics," Ms Bradford said. Nobody is being silenced. They are simply being encouraged to tell the truth. If the full facts are used to protest there is nothing further the government can add. At last. Some criticism about the content of my paper. It comes from feminist writer, Dr Anne Else, BA Hons, PhD, NZ Order of Merit. I see the Business Roundtable is at it again. They've commissioned a report from one Lindsay Mitchell, who is well known for being a virulent opponent of 'welfare' in general and the DPB in particular. The best way to stop young women - especially young Maori women - getting pregnant is to axe the DPB, she says. Now I just happen to have been looking up teenage pregnancy statistics recently. Births to teenage women (aged under 20) climbed from 5,315 in 1962 to a high of 9,150 in 1972. That's an increase of 72 percent. The DPB wasn't introduced until 1973. That was the year teenage births started to fall. By 1982, they had more than halved, to less than 4,500 - well below the 1962 number. Of course, the number of births is related to the number of teenagers. So let's look at this another way. In the early 1970s, before the DPB, 70 out of every 1,000 female teenagers were having a child. By the mid-1980s, this was down to 30 per 1,000. It stayed between 30 and 35 until the late 1990s, then it trended down again. By 2002, the rate was at its lowest in our recorded history, at 25.6 per 1,000 female teenagers. That's still high compared with all other developed countries except for the USA and UK. But there's no way you can argue that the DPB is responsible - or that axing it would lower the rate. Business Roundtable members head up major companies. If this report represents what they consider to be inteligent analysis, it's a bit of a worry, eh. First, Else's statistics are correct although she could have gone further and looked up the latest figures to find out the teenage birth rate is now back up to 32.9 per 1000. She points out that in the early seventies 70 out of every 1000 female teenagers was having a child. Then she describes how the rate trended down to our lowest rate in recorded history at 25.6 per female in 2002. A majority of teenage births in the early seventies occurred within a marriage albeit many were shotgun marriages. There were 9,150 teenage births in 1971, 55 percent within marriage. Many ex-nuptial teenage births resulted in adoption which peaked at around this time. The contraceptive pill became available in the 1960s and abortion in the 70s. Thereafter teenagers with an interest in controlling their fertility were better able to do so. There was every likelihood the teenage birthrate would decrease, as did the general fertility rate, dramatically. This doesn't mean the DPB availability wasn't having any influence. * 65.8 girls per 1000 aged 15-19 gave birth in the most economically deprived areas, classified as decile 10. * 6.92 per 1000 gave birth in the most affluent areas, or decile one. Looking at the general teenage birth rate tells us nothing about ethnic differences. 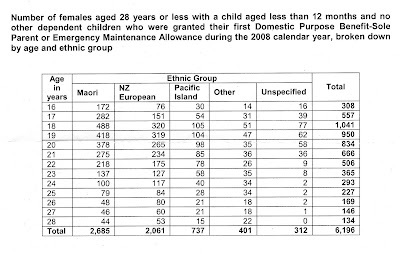 In 2000-02 the Maori rate was still up at 70 per 1000 - the same as the general rate in the early 70s. The Pacific rate was 48 and the European rate 22. As demonstrated, teenage births in the early seventies frequently occurred inside a marriage. Being a feminist Else is opposed to shot-gun marriages. She would prefer the state intervened. Many other teenage births ended up in adoption. Something Else is also strongly opposed to (at least the 'closed' variety). Perhaps she would prefer children stayed with their biological mothers at any cost. When one considers the indicators for a range of social problems, for example, landing in the Youth Court, coming from an adoptive home is not up there with other factors like being fatherless (top of Principal Youth Court Judge Andrew Becroft's list), being born to an adolescent mother, or being moved from one foster home to the next as a result. I cannot know if stopping lifestyle welfare (what we have now) will reduce the teenage birthrate, particularly that of Maori. The US experience was a decline in African American and Hispanic teenage birth rates from 1990 until 2006 with rises since. But even if the rate didn't drop, taking babies into the wider family, adoption or whangai, or channelling young mothers into jobs or training where they can combine their parenting responsibilities with work, would be preferable to what we do now. I used to write to Steve Maharey when he was Minister of Social Development trying to persuade him that welfare was no longer a safety net. Maharey was among the many people who refuse to accept that the DPB is frequently used by single women having babies. But the following statistic proves it. 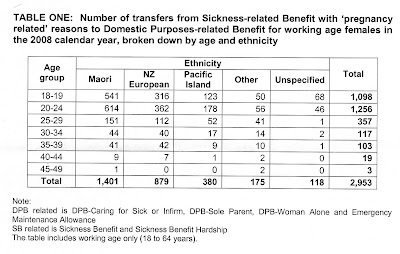 Over 2,300 females aged 18-24 moved off a sickness benefit for pregnancy-related reasons onto the DPB in 2008. These are women who (officially) have no financial support - no partner or job - before or after the birth. These females are a subset of the 6,000 plus that are granted a DPB for the first time each year with one child only aged 12 months or younger and in addition to the 5,000 who add a child under one year old to an existing benefit each year. So 17-18 percent of children are starting out life on welfare. If there was a 'relationship' between the mother and father it was short-lived. Around half of the total are Maori so around 1 in 3 Maori children start life on a benefit. Most of the births will be congregated in low decile areas. The problem with that is the 'normalisation' of the behaviour. That's a lifestyle. That's just the way it is. But it wasn't the way welfare was intended to operate. Analysis of longitudinal benefit administration data for New Zealand has shown that by the time children born in 1993 turned seven, half had been supported by one of New Zealand’s main social assistance benefits at least once. While this was a transitory experience for many, approximately one in five children in the 1993 birth cohort spent at least five of their first seven years of life supported by a main benefit (Ball and Wilson 2002). Daisy-up-the-duff does little but eat and sleep as she balloons. The other two went out in sympathy. Sorry for the repetition but we keep getting Sweden shoved down our throats as a shining example of a peaceful country thanks to the banning of corporal punishment in the home. When Swedish psychology student My Wilkstedt arrived at Otago University a decade ago, it wasn't only the fact that her friends had been smacked that upset her. "I was actually quite shocked," she says. But rugby upset her too. "I really couldn't watch it," she says from Malmo, near Stockholm, where she now works for the Swedish Corrections Service. "Let's face it, it's a violent game." I am equally shocked when a finger is pointed at NZ's violence from a country with violent crime statistics that pretty much mirror ours. And she works in Corrections so can't plead ignorance.